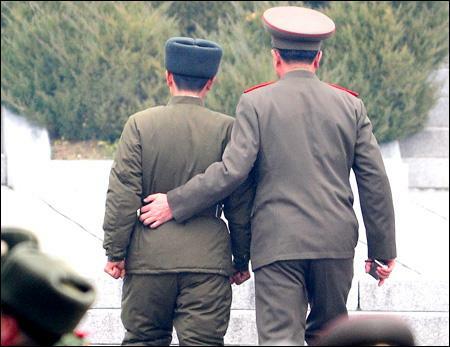 In a move that the president of the International Front for the Liberation of Outrageous Gayness, or I-FLOG, described as “Absolutely Fabulous!”, North Korea Wednesday announced the legalization of gay marriage. The announcement was met with a mix of astonishment and utter confusion worldwide. More on the story later…. The Mayors of four regional cities, Chungju, Chongju, Chonju, and Chinju announced their intention to merge and form a new mega-city, to be named New ChungChongChonChinJu City Tuesday morningat a meeting held, ironically, in Jeju. According to a spokesman representing the four mayors, the cities felt it was necessary to combine in order to compete with Seoul as well as the nearby planned Sejong City. Originally the mayors proposed that the new city be named New ChungjuChongjuChonjuChinju city, but some felt that name was too Ju-ish. The new city, pictured above, will stretch from Chungcheonbukdo all the way to the southern coast near Chinju. The combined population of 1.8 million will catapult New ChungChongChonChinJu City into the top tier of Korean cities. In addition to the large population, the city will be by far the largest municipal entity in the country. Certain details of the merger remain to be finalized, but the four cities have agreed on a new city slogan. They decided to combine the four existing slogans and hired a local Hagwon instructor to come up with the best combined slogan. Rebecca Lewis, a 28 year-old from Brisbane, struggled to make a decent-sounding combination. Finally she managed to dub the new city, New ChungChongChonChinJu City-The Happy, Vigourous, Vibrant Charm and Asianart City Worth Living In. The city of Seoul announced this afternoon that it had come up with a creative new approach to stop the seemingly never-ending incursions of protestors into Seoul Plaza. Starting in October, the much-loved circle of green grass in the heart of the citywill be surrounded by high-tech gas-fired ring of fire. The system, when activated during periods of impending protests, will shoot a scorching 3 meter wall of fire all around the plaza. The first ever winner of the Innaugural glorious production, North Korean Idol, was announced on Saturday in Pyngyang’s Kim Jong Il stadium. The winner, long considered a front runner in the competition, was the Great Leader himself, Kim Jong-Il. Pictured above just moments after being named the first North Korean Idol, Mr. Kim, fighting away tears, reportedly broke into an impromptu song and dance routine, much to the delight of the throngs of adoring fans. Teenage girls, middle-aged women, and grandmothers were joined by young boys, middle-aged men and grandfathers in a rapturous applause that lasted for over 30 minutes. During the competition, Mr. Kim successfully defeated other competitors, including the last semi-finalist, a four-year-old phenom who gladly accepted second prize. Most of Mr. Kim’s performances were classic North Korean songs, ranging from traditional folk tunes to rousing revolutionary denunciations of hated American Imperialists. However, Mr. Kim also showed great versatility and even sang one song in English. According to its annual report on the state of kimchi-making in Korea, the KimChi Institute in Gwangju claims that for the first time ever, more foreigners than Koreans are making kimchi . Long considered a staple of the Korean diet and culture, kimchi -making is rapidly becoming something that is done largely by foreign residents and tourists. According to the report, outside of restaurants and large Korean food companies, virtually the only people still bothering to make kimchi are “Japanese tourists and the wives of foreign diplomats and businessmen.” One enterprising company, KimChi4You, is planning to open several small factories at several locations where Japanese tourists like to visit. The plan is to encourage the tourists to experience traditional Korean culture, combining kimchi-making with underhanded labor practices. Stung by the ever-depreciating value of the Korean won, many young Korean women are replacing previous international tours to exotic places like Bali and Bangkok with more economic day trips to an even more exotic destination, the back alleys of Itaewon. The prime driver behind this new phenomenon is the pursuit of numerous clouds of cologne that waft behind all manners of non-Korean gentlemen. The tours are the brainchild of Ji-Young Lee, a twenty-something unemployed travel agent. Recently laid off due to the slumping tour business, Ji-Young was amazed by the variety and overwhelming power of the various “cologne cultures” that she encountered in various areas of Itaewon.